Good morning! I hope that your Christmas went well and that you're getting ready to welcome in a new year :). I'm stopping in today to share some classy Christmas cheer with you all, as well as a sweet and simple project too~ both for Blue Fern Studios! Blue Fern Studios has released some beautiful holiday themed chipboard pieces over the past month or so, as well as some wintry ones as well- simply perfect for this time of year! The "Let it Snow" set includes the title piece and snowflake you see here, as well as a tree and some additional snowflakes. A must-have! For the frame I first primed with gesso before applying embossing ink. I then sprinkled on some sparkly white and gold embossing powders as well as some glitter and then setting with a heat gun. The snowflake was treated with white embossing powder and set. Finally, the title piece was stamped with chalk ink and sealed with some glossy accents. Next I have a sweet and simple card for you! I love the "Winter Page Dangles", and I have been envisioning creating a tall, narrow card with one for a while now. I wanted to make sure the chipboard piece was the focus, so I kept the rest of my card fairly simple. 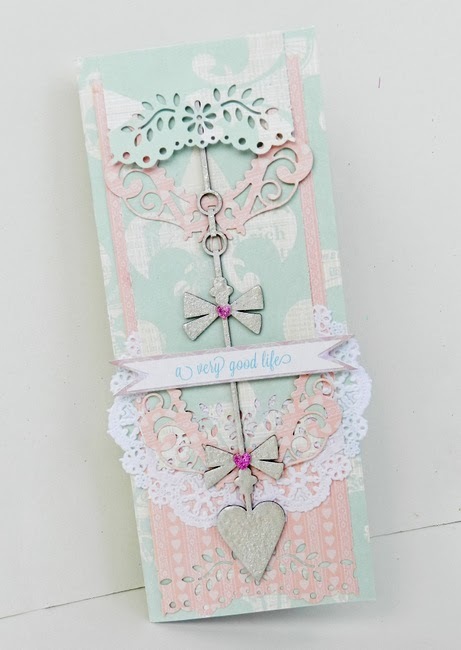 I used a white chalk ink before adding embossing ink and glittery white embossing powder to my chipboard. It turned out sparkly and feminine which was perfect for my girly card! Thank-you for stopping by amidst the holiday happenings! I hope you've had a chance to play along with our sketch challenge this month over at Blue Fern too- there's still time left to enter! They are both so pretty! Fab work with the chipboard pieces! Beautiful projects, Erin! I love that first one with all the glittery snowflakes--so pretty! The card is so prettily feminine. Stunning as usual! I hope that you have a wonderful and blessed 2014! Both of these are just beautiful! These are gorgeous.. so pretty. love the long card.. and I wish you all the best for 2014 too!